Sometimes as a book-dealer I think that I romanticise books. I want to believe they have some special sort of value; that books are in some way different to other products; that there's something special about books. And sometimes, as a book-dealer, I think books are just commodities, products like any other mass produced items. In fact the thought just occurred to me that books were the worlds first mass produced items. But maybe both these things are true and it's not the producing and selling of books that ultimately give them their value; it's the owners of books who say what a book is worth. I recently came across a book that demonstrates my point: it was an old library book, it had been printed in 1946, it wasn't a 1st edition and at some point the library had had it rebound. It was a common book on a subject no-one had much interest in. It was the sort of book that I, as a book seller, routinely throw away. For me its a book with not even monetary value. But written on the front free endpaper was the following inscription. "I bought this book from the dusty shelves of an old second hand bookshop in Westgate St, Gloucester... after dropping my mother and sister at the hospital. They were going to visit my dying father. I walked into the old roman town with my fiance and purchased this book, along with a copy if Ruskin's 'The Stones of Venice V.1' and returned to the hospital with the books. My father had died shortly after they had arrived, exactly the time I was in the bookshop. I therefor bought this book at exactly the time my father took his last desperate breath and discarded his life." The inscription was signed and dated and I wonder what value this book, this volume, had for the writer of that inscription. If there is something that makes books different, changes them from being just another mass produced consumer good, for me it is that books can carry meaning for us. In this case its an inscription but I think there might be more to it than that. For many people its the texts themselves that carry those meanings and so books become significant; become things that people want to own; to have to hand. I know I have many books on my shelves that I've not revisited in years, yet each of those books is there because at some point it affected who I was and what I thought and how I thought it. It remains to be seen if the same significance will ever be attached to Ebooks. 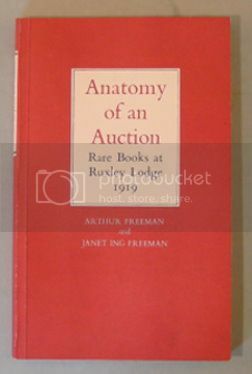 I've just finished reading "Anatomy of an Auction; Rare Books at Ruxley Lodge 1919" by Arthur and Janet Freeman. Published by The Book Collector it details the operations of 'The Ring' at a country house sale in 1919. The effectiveness of the ring at this sale can perhaps be gauged from the price paid for a Shakespeare first folio, a book that would, at the time, fetch perhaps £2000 in a London saleroom was sold at Ruxley Lodge to Quaritch for just £100. The Ruxley Lodge sale was a dispersal sale of the contents of an English country house belonging to the Foley family. The house and its contents were being sold by the 7th Baron, who it appears had little interest in and little knowledge of the books that had been collected by successive generations of his family. He secured the services of the auctioneers Castiglione & Scott to handle the sale, a firm well used to dealing with land and property but with little experience of the book trade and the books were badly catalogued by the auctioneers, making the work of the ring even easier; there were so many hidden prizes. A little while ago I was at an auction and ended up buying a book that I'd missed when I'd read the catalogue. 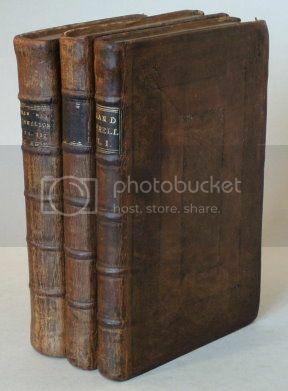 It was only after the sale had started when I noticed a book in the catalogue entitled 'The History of The Grand Rebellion', published in three volumes between 1713 and 1715. Given my interest in the history of the 17th century I bought it, not knowing exactly what it was and without having looked at the volumes themselves and I find myself quite glad to have done so. My first thought about these books when I saw the title was that they were probably about the Jacobite rebellion. The Jacobite rebellions are a consequence of the Glorious Revolution which saw the end of the Stuart dynasty in England and the placing of William of Orange on the throne of England. James II did try and land an invasion force in England in 1708 but was unsuccessful and the first serious rising is in 1715, after the first volume of this set had been published and if the subject of the book isn't the Jacobite rebellion then the only other likely candidate is the English Civil War and so it proved. Double-B-Books is proud to have joined the Antiquarian Booksellers Association (ABA) as an associate member. Founded in 1906 and the oldest organisation of its kind in the world, the ABA is the senior trade body for dealers in antiquarian and rare books, manuscripts and allied materials in the British Isles. Members are elected solely on the basis of proven experience, expertise and integrity and we're grateful for the vote of confidence that our membership represents. We also believe that in a digital age, where so much of our business is transacted anonymously over the internet ABA membership is the best guarantee of fair and ethical treatment that we can offer to prospective customers. ABA members pledge to abide by the ABA's Code of Good Practice probably the most stringent Code of Good Practice yet adopted anywhere in the world of books.